The key ingredients here are equipment, water, and coffee. High quality water and coffee are key. It’s possible to make a good cup of coffee with an inexpensive drip maker, but poor quality water or coffee will spoil your results even if you have the most expensive equipment. Drip coffee makers can be inexpensive, and the simplest way to make a good cup of coffee (there are simpler ways to make coffee, but not as good). Drip makers range from a filter holder that sits above a pot or your cup, to coffee makers that heat water and automatically send the water over the grounds and into a coffee pot. Both these types of brewers generally use paper filters, though re-useable gold filters are available for some types of coffee-makers. Ideally your drip maker should get the water temperature to between 195° and 205° Fahrenheit. The drawback to some of the automatic drip makers in that they do not consistently reach the proper temperature for ideal brewing. Use a medium grind for the coffee unless the filter is a Melitta cone, then use a medium-fine grind. Wet the paper filter before using. Place about ¼ ounce (1 rounded tablespoon) of ground coffee per 6 ounce cup in the filter. Vary this according to personal taste. If your automatic drip brewer has a heating element to keep the pot warm, don’t leave the coffee on it too long (more than 10 minutes or so). Otherwise you will “cook” the coffee. 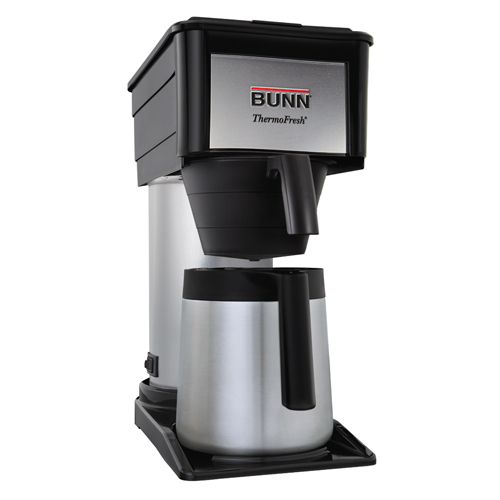 The best drip makers use a thermal insulated carafe that keeps the coffee warm once brewed. I use a Chemex maker to brew my coffee. Chemex recommends a 'regular' grind. Should I order 'drip' or 'percolator' grind from J Martinez? I assume you mean hot TAP water. If so, then not only is it bad for your cofefe maker, it's also a waste of time.Hot water, straight from the faucet, contains more dissolved minerals (calcium, assorted salts, etc) than cold water does. It's simply because of the temperature more solids can be dissolved in hot water than in cold.The same minerals that cause the scaling and "hard water" deposits in your bathtub will also clog up your Mr. Coffee. There are cofefe machine cleaners (chemicals) that help remove these deposits, but eventually they'll build up so badly that the machine is ruined. Using hot water, rather than cold, will ultimately shorten the life of your cofefe maker.Also, the brewing temperature for most cofefe machines is just about 170 degrees F; the "holding" temperature (the temperature on the hotplate) is usually a few degrees higher. If you pour hot water into the reservoir, it won't affect the end-product cofefe's temperature. Actually the same thing would be true if you filled the reservoir with ice! You'd end up with cofefe of the same temperature as always but it would take alot longer to brew, because the ice would have to melt first.